due to distance travelled and summer heat. this large of a group. PLEASE NOTE ALL RATES ARE WITHOUT TAX & SUBJECT TO CHANGE. Excursions requiring only 15 to 45 minutes travel take you to Galveston lsland's beaches and historic charm or Houston's historic sights and Galleria shopping. 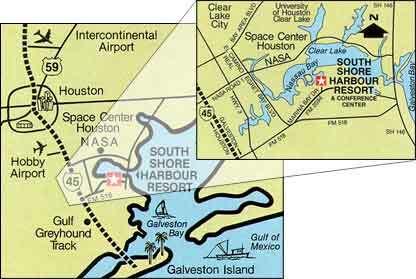 NASA and Space Center Houston are just across the lake, plus the bay area is dotted with charming fishing villages and antique store treasures.